03.05.2017, Strasbourg - On 3 May 2017, the Committee of Ministers' Deputies of the Council of Europe at its 1285th session adopted an unprecedented decision on the agenda item “Council of Europe and the Conflict in Georgia”, based on the decisions made by the Committee of Ministers' Deputies of the Council of Europe in 2014, 2015 and 2016, in which the CoE Member States reaffirm their strong support for Georgia’s sovereignty and territorial integrity holdng Russia legally accountable for exercising actual control on Georgia’s occupied territories. This decision is an important step towards defining the international legal status of the occupied regions of Georgia and outlines clearly the position that Georgia is prevented from exercising legitimate jurisdiction over its regions due to the illegal actions of the Russian Federation, including its continuing military presence therein. It is for the first time that the decision made within the framework of the international organization puts the blame for Georgia’s failure to exercise legitimate jurisdiction over its regions squarely on the Russian Federation.It is also worth noting that the Decision of the international organization for the first time recognizes that the conflict is between the Russian Federation and Georgia. According to the Decision the policy and actions of the Russian Federation with regard to the Georgian regionsof Abkhazia and Tskhinvali region/South Ossetia, including the conclusion of so-called treaties with the Georgian regions and referendums/elections held, impede peaceful conflictresolution, undermine the ongoing efforts to strengthen security and stability in the region, clearly violate Georgia’s sovereignty and territorial integrity and have no legalvalidity; reiterated that any illegalact aimed at changing the status of the Georgian regions will have no legal effect; called upon the RussianFederation to stop and reversethis process and to comply with its international law obligations and commitments, including the 12 August 2008 Ceasefire Agreement. 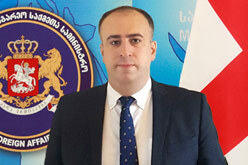 The Committee of Ministers' Deputies expresses its deep regret that despite the constant calls upon the Russian Federation to reverse the process of the installation of artificial obstacles along the administrative boundary lines (ABLs) which divide families and communities, violate human rights and fundamental freedoms and complicate the settlement of the conflict involving two member States, it continues this process; and that the closure of “crossing points” across the ABL of the Georgian region of Abkhazia is detrimental for freedom of movement and livelihood of the local residents and will further deteriorate the humanitarian situation. The Committee of Ministers' Deputies expresses its concern over the human rights situation in Georgia’s occupied regions that has been further deteriorating, and calls on Russia as a party exercising effective control, to guarantee and implement the right to education in the native language in the Georgian region of Abkhazia; to create conditions allowing for the voluntary, safe and dignified return of IDPs and refugees, and to protect their right to property; to remove any impediment, restriction or limitation to the right to freedom of movement across the ABLs; to cease the arbitrary detention of persons; to ensure that the residents of the Georgian regions concerned are not subject to discrimination on any grounds and to investigate allegations of human rights violations in Georgia’s occupied regions. According to the Decision, the Committee of Ministers' Deputies expresses appreciation for the various initiatives taken by Georgia to enhance humanitarian activities, interalia, through providing education opportunities and a free medical service to the residents of these regions. The Decision gives a clear political and legal picture of the situation in Georgia’s occupied territories highlighting the international legal responsibility of Russia as a party to the conflict. The Ministry of Foreign Affairs of Georgia welcomes the decision adopted by the Committee of Ministers' Deputies on the Conflict in Georgia and thanks the CoE Member States for their firm support.